Aaaand it's gone ... knew I shouldn't have posted. Lots of lightning visible already. Please make it to us. And severe thunderstorm warning is out. Warwick has had a couple of 69kph wind gusts from the SW as that storm went through only 3mm of rain though. It's nice seeing all the lightning from this storm in the distance,as I sit here watching tv and looking out the front door at the same time. Good looking lightshow, someonez gona have a smile! AND a STW as well, amazing! 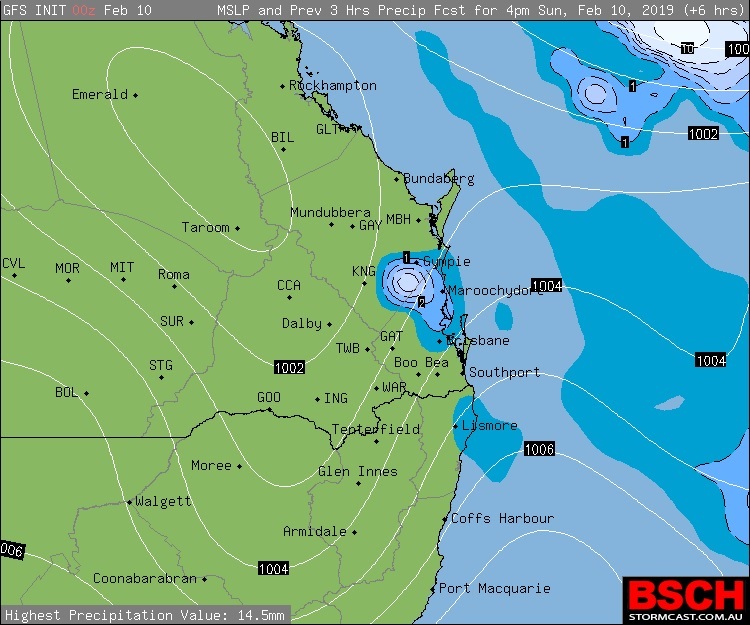 There you go BOM forecasting by radar, updated 9pm but they reckon in the west, what ever that means. West as in the first couple of k's of the western suburbs ? 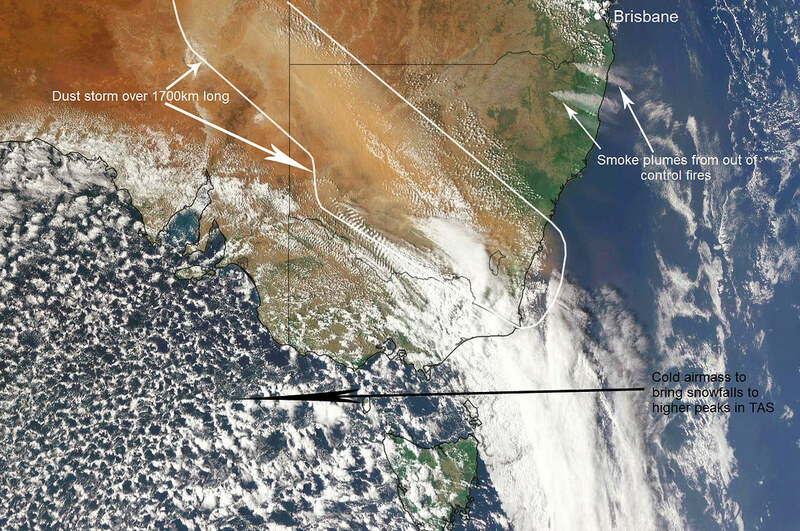 Saw high cloud gathering way to the SW late this arvo & thought, oh, wont get to us, too far away! Not too far from most now? We still gona miss out though! Two thunderstorms moved through here this afternoon and evening. 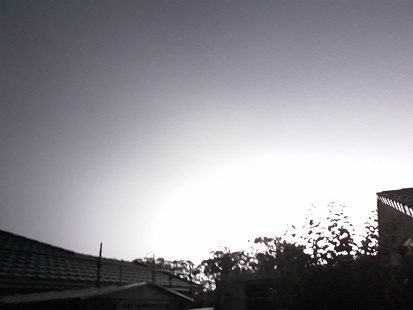 The afternoon storm brought a flang less than 200 metres away, quickly scurried back inside after that, lol. Photo after the first storm cleared away. 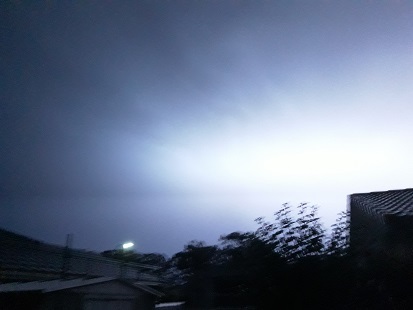 A couple of lightning pics taken on my mobile associated with the second storm. Just a slight, lingering chance of a storm here over the next couple of hours until the change moves through. A stormy afternoon/evening elsewhere on the Mid North Coast too. Very frequent lightning in some of the storms today. 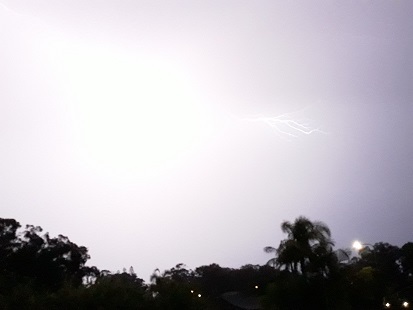 A hailstorm moved through Wauchope and Port Macquarie early this evening. There was also a 96km/h wind gust at Coffs Harbour this evening. Got 5mm here and not complaining. The wind gusts were quite incredible and we had to hold the lattice gate in our undercover area for a while because it bowed and threatened to break free. Weather station is down and has been faulty for ages. Wish I could comment on the wind accurately. ASG. Nice band of storms coming through. Lots of lightning and the occasional rumble. PAST 24 WEATHER SUMMARY... Overnight lightning to SW, but storms dissipated. I find Access C more accurate when it comes to forecasting severe weather. 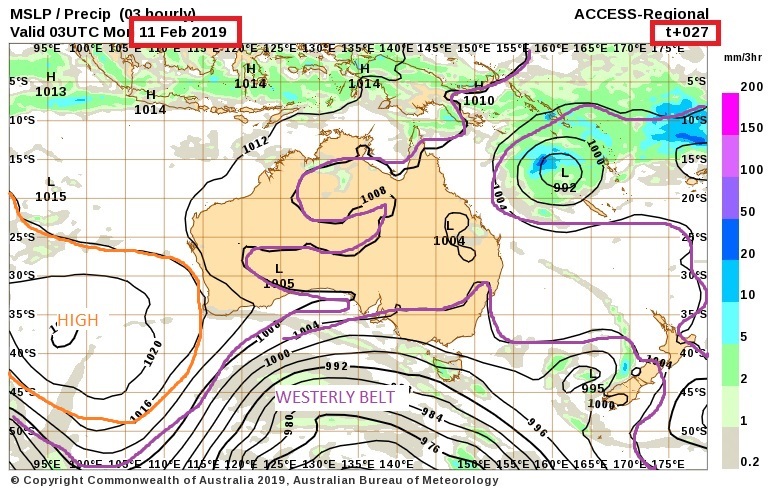 Yes, and the settled weather for Feb is strong highs with deep E'ly flows distributing tropical moisture onto SEQLD and NENSW. It elongates the convergence zone from the monsoonal flow. Yes this time of year the highs are generally well south. Wow, Mammatus metestrus, your understanding of the weather and climate for the mostly unrepresented Northern Rivers(and applies considerably to the others areas as well) is amazing. I read an article called Drought on Steroids. The main point was that the outstanding feature of this drought is the persistent well above to record high temps far beyond any other known drought and the extra damage it does. Just look at the coming weeks' temps. 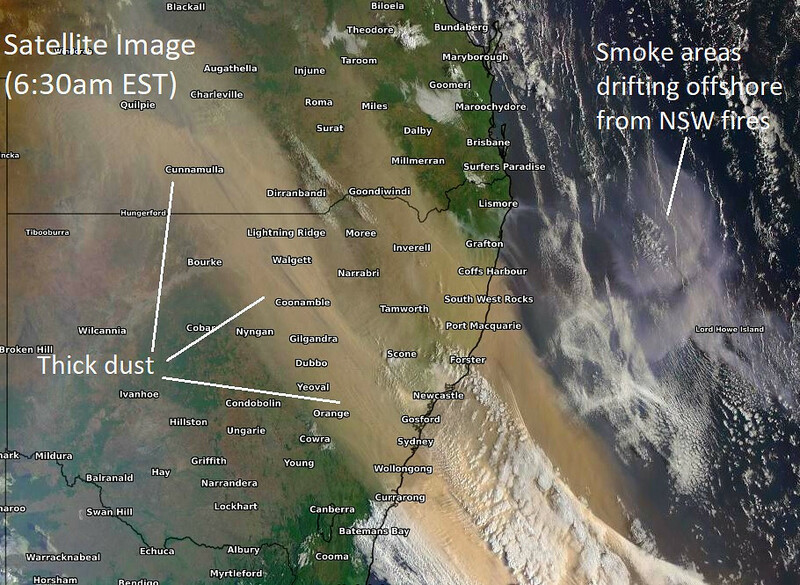 Here's that dust on the satellite imagery (via Weatherzone Layers) as at 6:30am this morning. 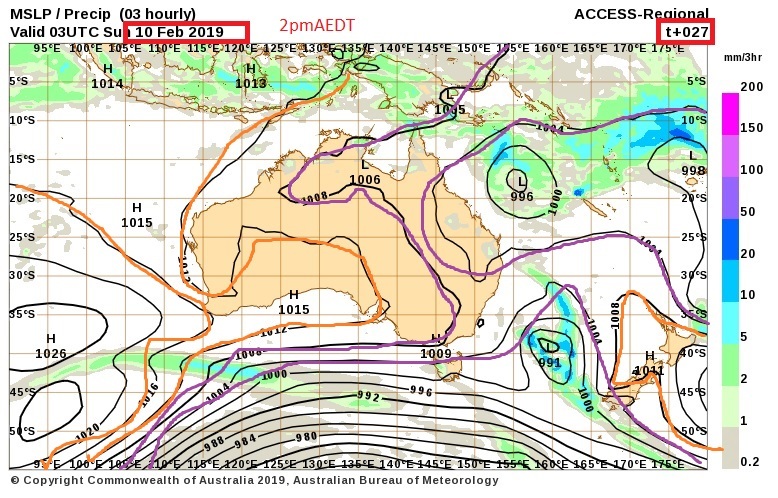 I think that although it's possible that our region may get some dust haze later today, the more NNW to NNE component developing in the wind flow in the lower levels of the atmosphere closer to the coast (helped by the seabreeze) could mean that the worst of it is confined to inland parts as far as coastal SE QLD goes. Very impressive sat pic Ken. I can see the first wave from here that is about 50km away. It looks very tall and as high as a thunderstorm so not like an apocalyptic looking rolling monster like the one that hit Dubbo early Jan or the one that hit White cliffs in Nov. The second wave appears to be thicker on the sat pic though and looks like it will be here late afternoon. After the Armageddon type conditions out there today comprising of extreme heat and dust what is the likelihood of some coastal thundery activity late tonight.Would be at least something to look forward too but not really a mention of such in the forecasts apart from a slight chance of a piddling shower near the coast. But I see on BSCH GFS is indicating at some precip later tonight could that be in the form of storms or rain or could it just be the models picking up the dust moving through that probably sounds stupid i know. Well we had an attempt at a storm here on Monday, we were only just on the edge of it and got 1.5mm, bringing our 2019 total to 2mm. On the 256km Mt Stapy loop, Is that smoke causing radar echos near Tenterfeild? Bit of a light shower out here. 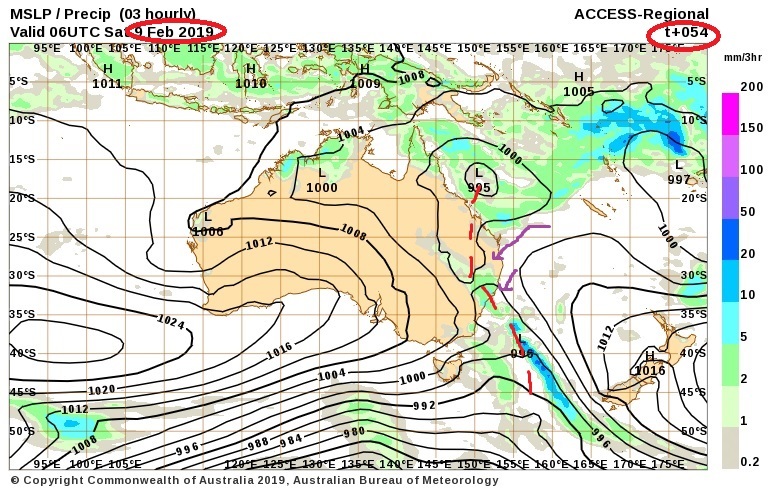 Ha, and a small light green blob on Stapy confirming I am not dreaming. Look at those awesome February dewpoints on the Downs - down to 0C. Dust haze approaching Wynnum. Vis 25km across Moreton Bay, but dropping to 8km in a line from NW to S. Seabreeze holding out the main dust area so far locally. Max today so far 33.4C Max dew point 25C. 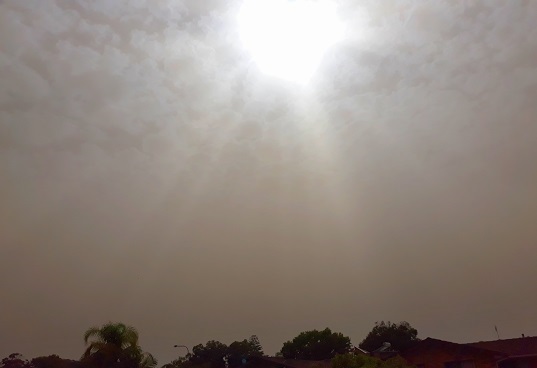 In Toowoomba, visibility dropped very quickly at about 1100 hrs, when the dust moved in. It was so quick that I thought it must be smoke from a Bush Fire, but the dust didn't smell of smoke, so I was somewhat relieved at that. I am a Member of the Helidon Hills Smoke-Spotters Group, and as the Fire Weather Warning for this area is "Extreme", we don't need any Bush Fires. Now at 1330 hrs, it's still quite hazy, but not as bad as it was a few hours ago. Max was 40.9 c here today, bar down to 998. Since sea breeze arrived now 36.9 and falling, dust haze present. It sure feels like they are. It’s 38deg in my work shed and I’ve been working in bare feet and bordies all day as the sweat was just filling my shoes up , and nothing was evaporating off my body , I’ve drank 3L of water and haven’t taken a piss yet hahaha. The first wave of dust has sort of passed and visibility got down to about 15km. meaning I couldn't see the mountains that far away. This next wave coming looks quite a bit thicker and longer in duration than the last. currently about 100km from my position. Highest temp out here was 38.9 but a dry heat. Still I just kept inside. ASG. Some serious warnings in place for just over the border for fires. A bush fire is burning in the area of Jennings, on the NSW and Queensland border, north of Tenterfield. The fire has burnt more than 6,100ha and is being controlled. A bush fire is burning near the Bruxner Highway, west of Tabulam. The fire has burnt more than 2,800ha. A bush fire is burning in the Tingha, Old Mill and Stanborough area. The fire has burnt more than 12,000ha and is out of control. A bush fire is burning in the area of Warrabah, north of Tamworth. The fire has burnt more than 1,500 hectares and is being control. Issued at 4:08 am EDT on Wednesday 13 February 2019. Hot, dry and windy conditions ahead of a trough are generating elevated fire dangers across the northeast corner of the state. All of this fire and dust makes me sick to the stomach even moreso now because it should not be happening in February. I feel for the people directly affected by this. wow some hot stuff today . How often would this region get 40 + deg in February? ----- Fabulous capture of that dust front Ken . Amazing. we saw the dust haze this morning and was a little heavier in the afternoon. A light gritty dust covering over the white car. Automated weather forecast giving the tweed a few mm of rain tomorrow. ACCESS R is showing the small precipitation signal largely off shore for us on the border. The surface synoptic showing some weak troughing on the coastline . Sunshine coast 2pm until Friday lunchtime. Again l say ACCESS r has most of the activity just off shore with the dregs for the land. Yea will be interesting to see if there is some precip tonight or early morning perhaps associated with the change. Think Tweed is probably best chance or south. GFS showing abit of a precip signal tonight or early tomorrow morning...doubt it though . Vis down to 9km here now and this is just the start and will last for hours. I feel like I am getting micro - derm abrasion on my face every time I wash it. Getting hard to breathe. Most of this is going north of us here to CQ though. It is very cool to observe but those with respiratory problems should stay indoors. ASG. Dew points were very low here this afternoon compared to areas east of here. The high was around 39 but it felt like 33-34. I saw a dew point of 4 earlier, it might have been lower than that. Even right now the temp is still 32 with a RH of 15%. Still 32.8C atm, thank xxxx for the aircon & the electricity to drive it. 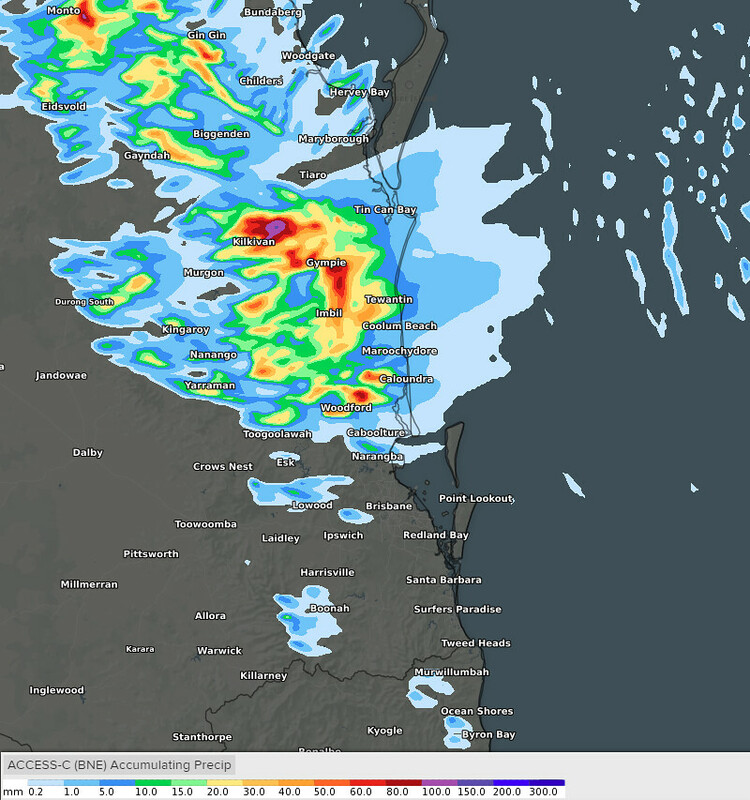 Pretty cool sight on the Gympie radar, dust front heading east while the seabreeze front is still heading west (went through Kingaroy about an hour ago). Cells springin up near border ranges. 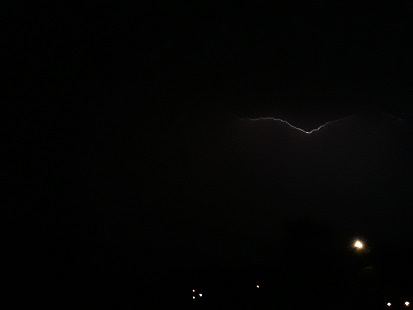 Abit of thunder locally here too. Hopefully temp drop there is a good measure of what we should get further north, cos I would like to get some relief tonight. edit: actually I just looked at readings at Ballina and Evans Head, not much change - do you think it is just a wind without much affect on apparent temp? Just got the smallest touch of the rain and thunder at Caloundra South. Went outside to stand in it just to feel. The southerly change arrived here around 11am this morning. Some passing showers have moved through since sunset. 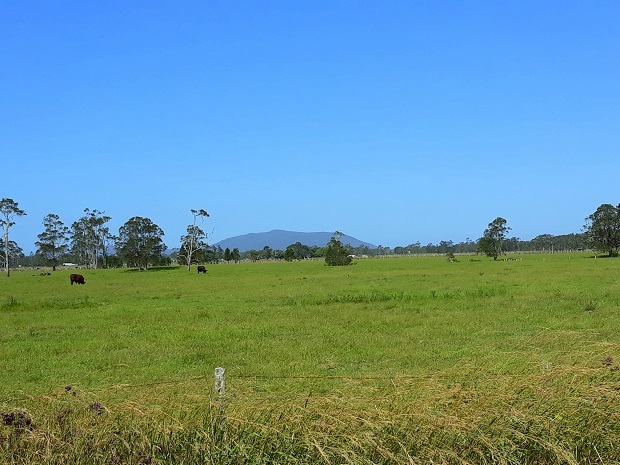 Today, Coffs was only 0.6°C off its February record high of 40.5°C which was set back in 1952. PAST 24 WEATHER SUMMARY... Dust haze developed early afternoon, thinning overnight. Is anyone else getting an error message trying to bring up any maps in WZ? Warm windy southerlys at it again. Thanks one drop. I am still having the same problem. 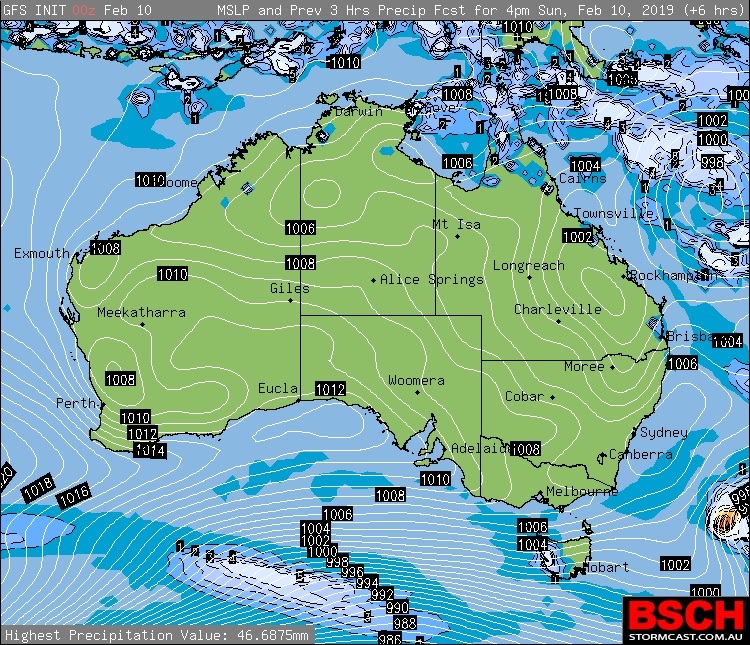 BOM forecast is for S/SEs for next few days. Temps for Brisbane are for +30s. Is this unusual? I would have expected <30s with trades. Could this be due to shorter fetches across Tasman or warmer than average SSTs? Any comments anyone? I have never seen 30+ degree temps after a southerly change. And the winds are actually quite decent. Next Tuesday has light winds turning SE'ly 15-20 kph in Brisbane with 33 degrees. Crazy stuff. yeah, i'll take any weather over this heat. endless heat. 9 months of summer 1 month each of the other 'seasons' lately. 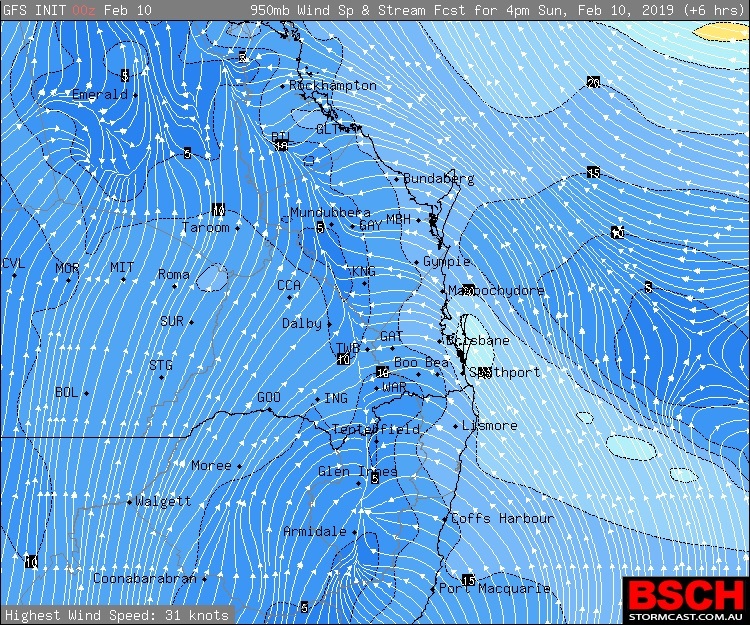 Yeah gfs has Yeppoon on 36 with SE winds next week WTF , se winds are cooler ? not hotter? I thought perhaps the southerly was only a very weak at the surface, but GFS shows south-easterlies almost right up through the atmosphere for Tuesday and Wednesday across SE and central QLD. Baffling. The onshore showers overnight brought 5.0mm in the 24hrs to 9am here. 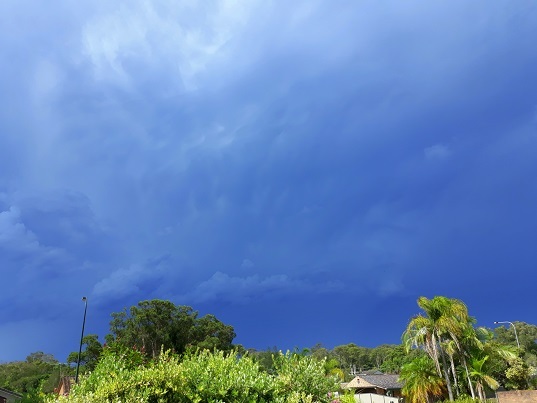 Port Macquarie (13.8mm) and Dorrigo (28.2mm) had their wettest days so far this year. 3 registered (pikopancho, mithrandir, Multiversity), 60 Guests and 2 Spiders online. Generated in 0.143 seconds in which 0.008 seconds were spent on a total of 13 queries. Zlib compression disabled.